The Washington National Opera's Faust goes directly to Hell. Hellbound: Raymond Aceto as Méphistophélès in Faust. Photo by Scott Suchman for the Washington National Opera. In the last hundred years, Charles Gounod's Faust has fallen from the pinnacle of the repertory. Its descent has been rapid, almost as fast as that of its protagonist, a searching scholar who sells his soul to Satan in the opera's first act. Faust has fallen into irrelevance in this new century. Its stirring choruses, sweet harmonies and story of demonic love and angelic redemption seem quaint in this dark age. When fascists are defended in the media by the sitting President, and hatred lurks in the corridors of power, Faust just ain't scary anymore. 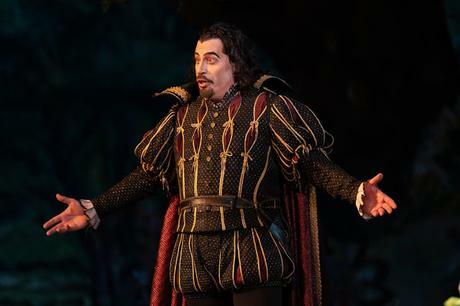 Perhaps it's fitting thoen that the Washington National Opera has offered a revival of this chestnut, swaddled in a "traditional" production that almost feels like period performance. This Faust, directed here by Garnett Bruce, is simple and gorgeous to look at, opening with a show curtain hell-scape, back-lit to reveal Faust at his studies. The middle acts are all cherubic peasants and trompe-l'oiel foliage, with a Disney-style cottage for Marguerite and a bleak snowscape for the fourth act. All this might appeal to even the most cynical opera-goer. However these quaint sets (first seen in 1985 at the Houston Grand Opera) were filled by a cast that might have considered trading in their souls for singing lessons. In Germany, this version of Faust is known as "Marguerite" to separate it and its libretto (drawn from a very sentimental French version of the drama) as far from Goethe's original poem as possible. The renaming is because this version of Faust is really Marguerite's story. She is seduced, impregnated and abandoned by Faust, who is already a soulless monster. Only in the last pages does she pray for forgiveness and escape the Devil's grasp as a heavenly choir sings of her salvation. And yes, while all these events are in Goethe, the opera's focus away from the philosophical implications of the original poem leave it a pale imitation of the original. Here, Marguerite was sung by Erin Wall. She made an effective, pretty entrance and did well by the "Jewel Song" in the third act. However, when it was time for her to sing in the big quartet, she was resorting to hit-and-miss notes above the stave. Matters got worse as the opera rolled on, as Marguerite is one of those roles that gets heavier and more difficult as her situation worsens. She was even wilder in the church scene and in the final trio, delivered an approximation of pitch. On the plus side, her acting was heartfelt. Marcelo Puente has a small but potent instrument, with the squillo quality one associates with Italian opera. The problem is Faust is in French, and his singing lacked the lightness and lyricism needed to carry off this role. Although he was impassioned and convincing in the all-important first scene, his "young lover" persona was sort of blah, hardly the type to sweep a young maiden off her feet. It didn't help that this staging excised the big dramatic moment in the Walpurgisnacht scene, by cutting that entire sequence. The Faust libretto reduces Méphistophélès to a cross between a stage magician and a tour guide, conjuring caskets of jewels and putting the whammy on any character standing in Faust's way. Raymond Aceto had personality to give but his voice sounded smallish when it should have roared. This disparity was emphasized during the church scene, when he boomed condemnations at Marguerite through an amplification system. When his demonic figure finally appeared and sang with his real, small voice, it was like Toto pulling back the curtain on the Wizard of Oz. The best performances of the night came in smaller parts. Joshua Hopkins made the most of the brief and ungrateful role of Valentín. This fellow gets to deliver the best tune in the show ("Avant des quitter lieux," added by the composer from a tune in the overture after the opera's premiere), goes off to war, comes back to condemn his sister's pregnancy and then gets killed by Faust. Gounod does give the fellow a great death scene, which Mr. Hopkins sang with lyric power. Allegra de Vita made Siebel's brief appearances in the opera entirely welcome, and Deborah Nansteel did well in the short role of Marthe. In the pit, the Canadian conductor Keri-Lynn Wilson took a hit-and-miss approach to the score. The Prelude to Act I was slow and turgid, fawning over the quasi-religious harmonies in the score but lacking in forward thrust. She put the hammer down for the bustling Act II scenes, where the swarm of peasants, tumblers and even a juggler threatened to engulf the leads in a flood-tide of merry-making. The chorus made its welcome return as soldiers coming home from war in Act IV, singing with firm and resonant power to the cheerful snap-rhythms of the score. They also provided solid support in the big heaven-and-hell finale, producing a mighty shout that elevated Marguerite to her celestial reward.